Bring joy to any room with your new Joy Desk Standing Workstation by Stand Steady! This fixed height stand up desk has a sleek, minimalist design, handy cubbies, and a raised platform that keeps your monitors at a more comfortable viewing height. It's also really spacious, giving you plenty of room to work! 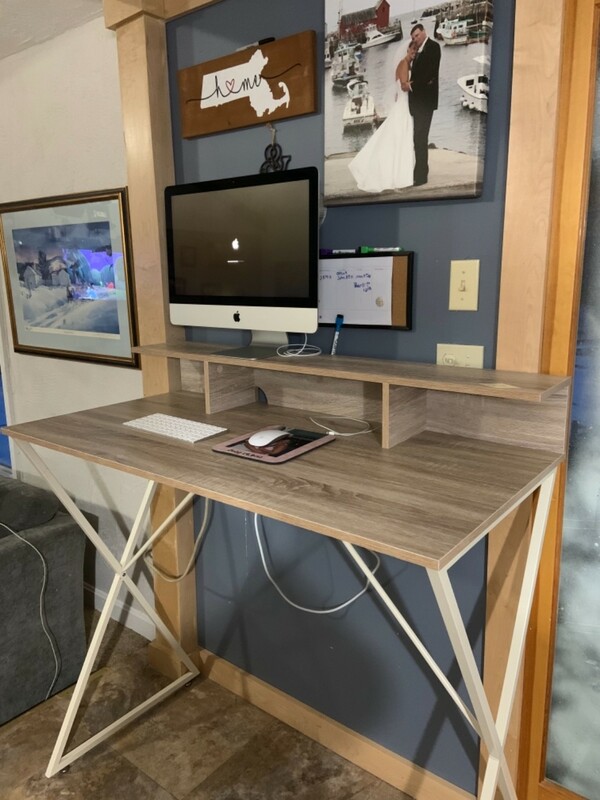 BEAUTIFUL MODERN LOOK: This stand up workstation is designed with an eye catching A-frame base and distressed maple veneer! ERGONOMIC SETUP: Your new standing desk has a work surface that's 41.5 inches high (for perfect keyboard placement! ), plus a shelf that's 48 inches high to keep your monitors at eye level! EXTRA STORAGE SLOTS: Keep all your accessories and knick-knacks in your three storage cubes! SPACIOUS SURFACE: The desktop of your new home standing desk is 23.75” x 47.25”. That’s plenty of room for use as an art desk, workstation, gaming desk, or for any hobby or craft you're into! STURDY: Your new office desk, while sleek and beautiful, is also strong and sturdy! It can hold up to 60 pounds. So feel free to load it up with all of your favorite things! Easy to assemble and sturdy for the job! I’m using for my mac desktop and moddle of the house desk. Many of the screws could not fit in their intended holes even using a power drill. Was only able to assemble one side of the leg stand. This product once assembled would be very useful however it’s now useless. It’s a $150 waste. 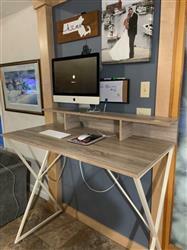 Great Standing Desk - Exactly as pictured! Really like this desk - exactly as pictured and described. I can fit my 20 inch monitor, a lamp, and ipad on the top shelf. Laptop, mouse, and pad of paper on the main desk area. What's also great is that there is space to fit a shelf underneath the desk for more storage purposes - I have a set of shelf cubes that measure 36 inches high/36 inches wide/12 inches deep that fit perfectly below! I would suggest finding a way to drill a hole for your cords/wires if you'll have a lot of equipment to plug in. Not a big deal for me - the surface area is not smooth, edges may need to be sanded down a bit, in the meantime I've covered the main desk area with a scarf so I don't scratch my arms. If you write on paper, you'll also need to write on a pad or another hard surface. If you put heavy equipment on the desk I would recommend to anchor the desk to a wall to prevent wobbling. Overall, very pleased with this product and highly recommended! Perfect for a reception desk. This desk is PERFECT for my hair studio. I am using it as a reception desk to check people in & out. The height is perfect, it doesn't take up too much room, the color is beautiful! It's a gray toned wood color and looks like real wood. It even has wood grain which makes it a little hard to use a writing surface (keep in mind in buying for a regular desk) but it serves the purpose I needed it for perfectly! Everyone compliments me on it. I am a female that enjoys building stuff and this took me about 30 mins to put together, the directions were very clear to me and its SUPER sturdy, no wobbling! I do not have mine up against the wall either, its stand alone. I like the look and simplicity of this desk- and for the $150 price tag, it does what I want it to do. Two things that I don't like are: 1.) It's pretty unsteady. I can type, but any other type of office work such as hole punching papers, makes the desk wobble. It has leveling knobs on the feet, but it's just lightweight and not made for that type of work. 2.) The desk top itself is ridged so if I want to write, I need to write on several pieces of paper stacked together or on a clipboard.